One of my favorite parts of the wedding day is the morning of in the bridal suite. With anticipation and giddy nerves, my brides and her bridesmaids are always having so much fun getting pampered for the day. When it comes to romantic bridal hairstyles, I’ve seen it all: loosely curled waves, chic chignon looks, floral crowns… you name it. The key to the perfect hairstyle is finding the right look for you as a bride which means the right formality, style for your hair type, and the perfect look for the weather you’ll encounter. Below are some of my tips for achieving your loveliest bridal hair. One of the best trends that have come out of the last three years is the creativity of hair artists to tie the wedding day and the hair together. 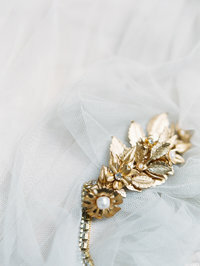 Taking blooms from your bouquet of choice and working them into your hair brings a cohesion to your entire wedding look. Some things to keep in mind, make sure to replace the blooms midway through the day, especially if you are getting married in the summer. The blooms will fade more quickly than your bouquet because they are not not in water. Also, remember that you can string the blooms together to create understated flower crowns. What most high fashion brides are finding is that a big flower crown that circles their entire head is often too much for the big day. Instead, try adding subtle hints, like a few fall leaves on the side of your bun, or a little vine twisted through a braid over huge full roses places all around your head. The larger crowns are going out of style, but the subtle hints of nature are truly a classic look to last through the ages. As women we have more options than every before on the color and crop of our hair. With all the dying, cutting, and teasing our hair goes through, it’s definitely hard to grow it long and luxurious. Luckily, the world of hair extensions has gotten easy, affordable, and they can look incredibly natural. Our preference over at City Style Bar is to used Laced Hair Extensions. We rent them out for the day of your wedding, but you can also buy your own set from us starting around $300. These extensions are made from real hair, and we recommend getting them dyed to match your current color. I have light blond hair and the extensions matched mine immediately without dying. If you’re planning on wearing them often, we suggest bringing them into the salon or taking them to your own hair dresser so they can cut and layer them to blend in with your own locks. Please make sure your stylist is familiar with cutting extensions, otherwise they could cut them too short and you would waste your money. The extensions will give you that full, luxurious look you’re wanting on your wedding day. There are so many options on your wedding day, so how will you decide? We recommend really looking at what your preferences have been over the years of your life. Have you often pinned photos of Grace Kelly and Marilyn Monroe? Then we suggest going for the classic set curls of the 1940s. Do you love the look of Cindy Crawford’s 1980’s beach waves, then make sure to use the right products that will hold the loose curls you seek. Some of the most classic looks are Kate Middleton and Nicole Kidman’s loose curls, Grace Kelly and Carolyn Bassett’s low buns, and Jessica Biel and Gwen Stefani’s large chignons (they also opted for pink wedding gowns!). When choosing a hair and makeup artist, it’s important to make sure that their makeup will last through out a hot day. A well versed makeup artist will make sure you look your most lovely, won’t turn you into a drag queen, and will have high end products that won’t melt off during the ceremony or even into the evening of dancing. While getting a mid day makeup touch up is absolutely recommended, it’s also a good idea to education yourself on certain products. Ask your makeup artist what line of cosmetics they use, what kind of finishing spray and powder, and if they will prime your lips, eyes, and face (all of those need different primers, by the way!). We love Dior and Yves Saint Laurent. Avoid the cheaper brands on your wedding day, it’s definitely a time to splurge on the best products on the market. The same holds true for hair, make sure to look through the portfolio of images from the first to the last moment of the wedding day to see how the style has held up. « Irish Destination Wedding Sneak Peek!